Early Bimotas really straddle the “classic” and “modern” sporbike eras and helped set the stage for the mass-produced machines that followed. Prior to bikes like the SB3, monoshock suspensions and fully-faired bodywork were really only seen on factory racebikes, and it’s hard to comprehend just how exotic the SB3 was at the time. Although the price was steep, it was virtually the only game in town, until the advent of the GSX-R750. I’m a big fan of red frames on bikes, assuming the frame is actually worth emphasizing and on these early Bimotas, the frame is basically the whole show. Not that the aerodynamic, quick-release bodywork isn’t worth a look, but it’s just the icing on the cake. The integrated signals are another nice touch, something that didn’t really find its way into widespread use until the past couple decades. But that frame was the only game in town if you wanted top-shelf race technology for the road. 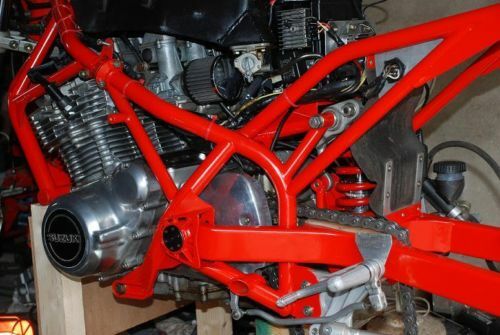 Wrapped so tightly around the virtually stock Suzuki GS1000 engine and transmission that powered the bike, it was designed to separate into halves to allow the powertrain to be removed for servicing. 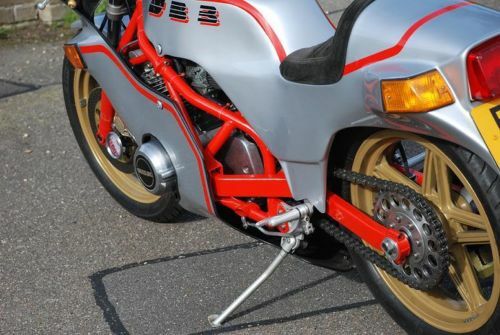 And the very trick concentric swingarm pivot and countershaft sprocket kept geometry and chain tension constant throughout the swingarm’s entire range of movement. At 483 pounds wet, the bike’s main advantage in terms of straight-line performance came from a massively reduced weight compared to the original Suzuki. 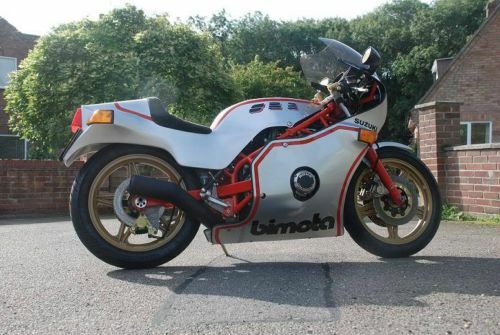 While suspension was compromised for the road by being far too stiff, according to contemporary tests, it’s easy to argue that wasn’t really the point, and anyone able to afford a Bimota could certainly pay to have the forks and shock retuned to allow for road use. The SB3 has always been a very rare bike: just 402 were built worldwide. This one is Number 9 (frame number 0009) and was the first SB3 in the UK. 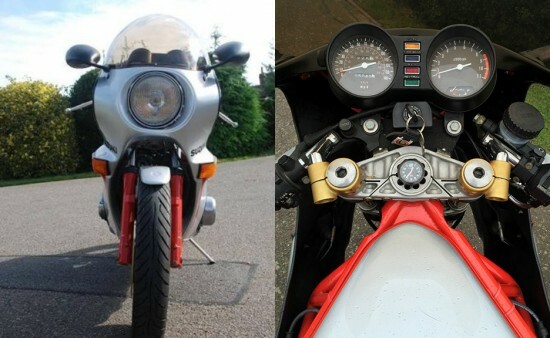 Its history & provenance is fully documented – it’s a very special bike, with just 4 owners from new; two of those from the same family (Bought new, sold to son-in-law, then sold on to its third owner, then repurchased by the original owner before being bought by my father in law). It comes with the original bill of sale (see photos) and a letter to the DVLA – when it was returned to its original number plate after having had a private plate – which describes its history very clearly. A photo of this letter also attached. It has covered just 6,332 miles from new, with a documented change of speedo under warranty at the first service, hence only 5,045 miles showing on the clock today. 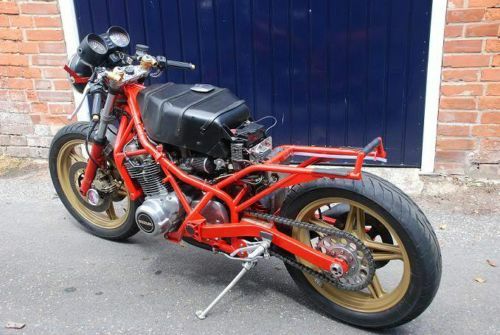 This very bike was the one displayed at the Earls Court bike show in 1979, and then road-tested by Motorcycle News. This SB3 was already in lovely original condition when my father-in-law bought it in 5 years ago, but he still carefully stripped it down and treated it to a full cosmetic restoration – having the frame and fairing professionally resprayed, and the Marchesini wheels re-painted in the original gold. 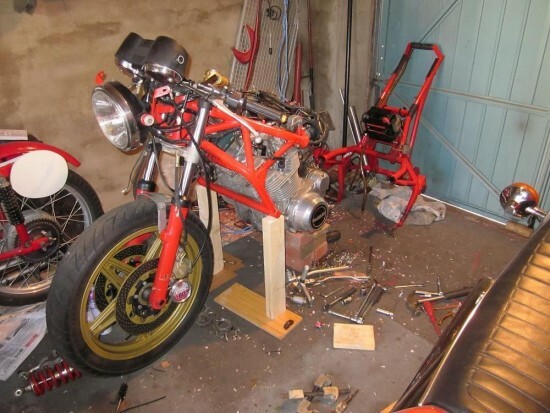 It has always been garaged, and is in outstanding original condition as you can see from the photos. There are a few marks on it here and there, so am not going to describe it as being in concours condition, but it’s pretty close! 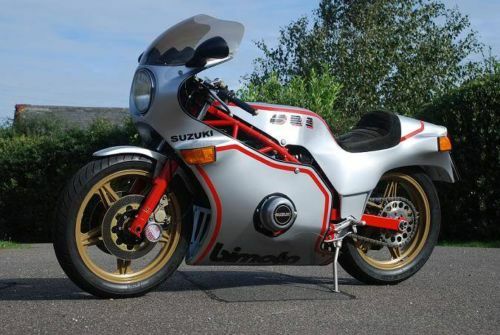 I could go on an on about this bike, but no doubt if you’re looking at this advert, you’ll already be aware of what it is, and the fact that its likely to be many years before another SB3 comes up for sale. A truly unique opportunity to own a rare piece of superbike history. Viewing can be arranged in Colchester, Essex. Collection only. Payment by BACS or cash on collection. Well, that last bit could present a problem. I assume that, by “collection only” he means he won’t arrange shipping, but you could just see it as an opportunity to head to Colchester on vacation! One of my favorite color schemes is silver and red, so it’s no surprise that I really like this bike. Although at £19,995.00 [approximately $30,787.00] it is far out of reach for me for the time being.